A warm summer’s day. A cold winter’s night. Spicy food. Seafood. Chinese. Dessert. What can’t you pair with some nice rieslings? So we were very excited to try Chateau Ste. 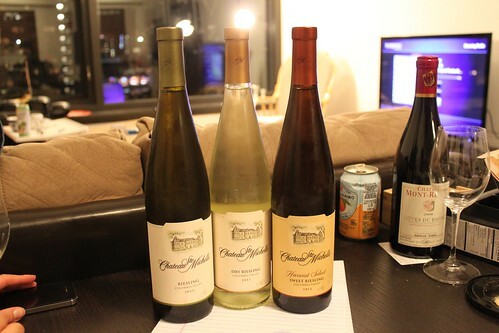 Michelle’s rieslings—a beautiful trio of dry riesling, riesling, and sweet. The winery was good enough to send us a box of the wines to try, and it was a sight to behold when we carefully opened up the box to see the three bottles for the first time. 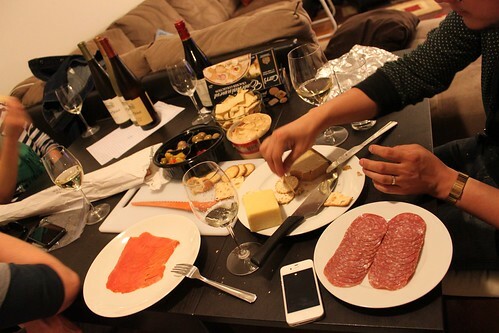 What better way to enjoy these wines, we realized, was with good friends and good food? 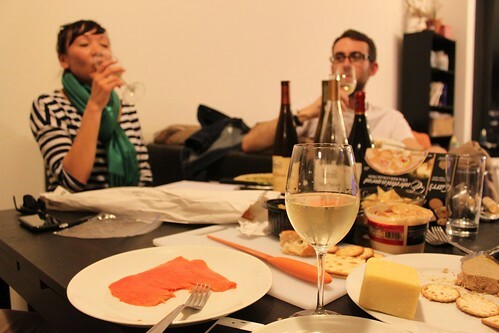 And so we thought it was a great occasion to have a riesling party. Rieslings are celebrated as an extremely versatile wine that is easy to pay with a wide range of flavors. 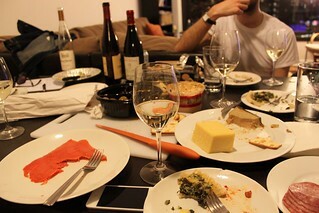 In light of that, each of our friends brought over one type of food that we thought would be fun to pair with the rieslings. 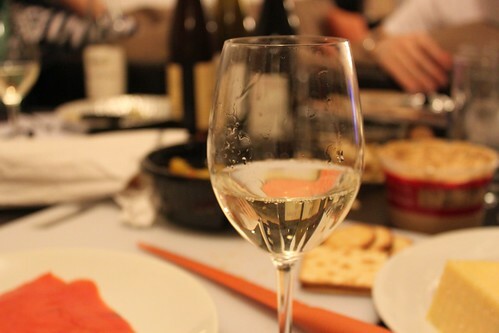 Common suggestions for the sweet white wine often include the likes of spicy thai food, sweet desserts, salads, and pork. But we thought we’d eschew these common suspects and try different types of every day food to see which flavor paired with each wine. The taste: Partiers noted vanilla, pear, and apricot flavors. The light drink was lovely way to ease into the meal on a hot summers day. Most successfully paired with: Salmon, salami. The taste: A bolder, more buttery, low-acid riesling that was citrusy and sweet. Great as a table wine and main course accompaniment. Most successfully paired with: Spicy hummus, pickled garlic, bleu-cheese-stuffed olives, quiche. The taste: The sweetest of the trio and the richest, though in the grand scheme of rieslings, it still ranked as medium sweet, making it a great main-course accompaniment. The flavors were warm, like peaches, and fresh, like we were sitting in the vineyard. Most successfully paired with: Dubliners Irish Cheese, brie, black pepper chicken pate. The verdict: The Chateau Ste Michelle rieslings are nice wines to have on-hand at home to accompany with your dinners or to cool down on a summer day. Despite their name, most of them sit in the mid-sweet range, making it accessible for many.